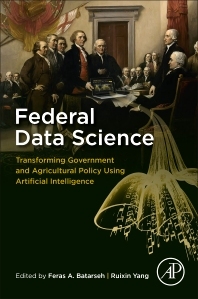 Federal Data Science serves as a guide for federal software engineers, government analysts, economists, researchers, data scientists, and engineering managers in deploying data analytics methods to governmental processes. Driven by open government (2009) and big data (2012) initiatives, federal agencies have a serious need to implement intelligent data management methods, share their data, and deploy advanced analytics to their processes. Using federal data for reactive decision making is not sufficient anymore, intelligent data systems allow for proactive activities that lead to benefits such as: improved citizen services, higher accountability, reduced delivery inefficiencies, lower costs, enhanced national insights, and better policy making. No other government-dedicated work has been found in literature that addresses this broad topic. This book provides multiple use-cases, describes federal data science benefits, and fills the gap in this critical and timely area. Written and reviewed by academics, industry experts, and federal analysts, the problems and challenges of developing data systems for government agencies is presented by actual developers, designers, and users of those systems, providing a unique and valuable real-world perspective. 1. Data managers, software engineers, and database administrators at the government (at agencies aiming to inject data science into its operations). 2. Industry’s data science consultants and specialists who build analytical projects for the government (ones from vendors such as: Salient, Tableau, SAS, SPSS, Oracle, Microsoft, MicroStrategy, and IBM). 3. Students and scholars in majors such as: Big Data Analytics, Science and Technology Policy Making. 4. USDA economic and agricultural analysts. Especially ones who perform statistical studies. 5. Science and Technology policy makers, government officials, and journalists. Feras A. Batarseh is a Research Assistant Professor in the College of Science at George Mason University (GMU). His research spans the areas of Data Science, Artificial Intelligence, Federal Data Analytics, and Context-Aware Software Systems. Dr. Batarseh obtained his Ph.D. and M.Sc. in Computer Engineering from the University of Central Florida (UCF) (in 2007 and 2011); and a Graduate Certificate in Project Leadership from Cornell University (in 2016). His research work has been published at prestigious journals and international conferences, as well as several book chapters. He taught data science and software engineering courses at multiple universities including GMU, UCF as well as George Washington University (GWU). Prior to joining GMU, Dr. Batarseh was a Program Manager with the Data Mining and Advanced Analytics team at MicroStrategy. Throughout his career, Dr. Batarseh worked with multiple federal and state government agencies on a variety of data science applications and analytical deployments. Additionally, he helped several organizations develop intelligent systems, make sense of their data, and gain insights into improving their operations. He is currently working with the Economic Research Services (ERS at the US Department of Agriculture) towards building intelligent data management systems. He is a member of IEEE, ACM, BICA and STP professional communities. For more information and contact details, please refer to his webpage: https://cos.gmu.edu/ggs/people/faculty-staff/feras-batarseh-2/. Ruixin Yang is an Associate Professor in the Department of Geography and GeoInformation Sciences (GGS) - College of Science at George Mason University. He received his PhD in Aerospace Engineering from University of Southern California in 1990. His research areas ranged from Fluid Dynamics, to Astrophysics and General Relativity, to Data Science, Data Information Systems, Data Analysis, Data Mining, and Earth Systems Science. On software engineering, Dr. Yang led a software development team that built several prototypes for earth science data information systems. The systems include Virtual Domain Application Data Center (VDADC) prototype system for on-line Earth science data analysis through Web technology; Seasonal to Inter-annual Earth Science Information Partner (SIESIP) online data search and analysis system, which integrates Oracle Database Management System, Java web technology, and GrADS, a data analysis and visualization software package; and an XML-based Distributed Metadata Server (DIMES) for representing, storing, retrieving and interoperating metadata in a distributed environment. Recently, Dr. Yang’s research is focused on exploratory data analysis and/or data mining with advanced data analysis methods to hurricane related earth science data. He has published several referred papers on earth science data search, access, online analysis, metadata management, content-based search, bid data analytics, and data mining for rapidly intensifying tropical cyclones. He can be reached at: ryang@gmu.edu. Data science will change your government pretty soon, this book helps you understand why, how and what to do to harvest the benefits of data. If you want to learn about the 'real' data science, get this book.